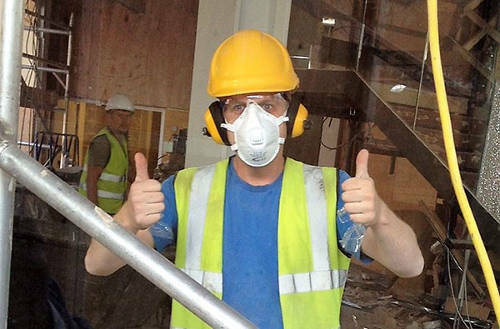 The Health & Safety Executive October site inspection initiative controlling dust. The HSE will be visiting sites this October focusing on the controlling of dust on construction sites. Companies in breach of their statutory duty to control dust or expose their workers to dust will face enforcement action and fines. You can find information guidance sheets when you login into the HSE web site. Below are controls that can be put into place on your construction sites. (a) Burning of materials on site should not be permitted. (b) Using processes which do not generate hazardous fumes and hazardous dust. (d) Dust pollution can be minimised by screening, if practicable. (e) Wheel wash facilities provided on sites. (f) Watering down to minimise dust transfer into neighbouring premises. swept to prevent any accumulation of dust and dirt. (h) Skips and removal vehicles should be properly covered when leaving the site. (i) Limiting the number of people near the work. (k) Order the right size of building materials so less cutting or preparation is needed. If you are a Site Manager or Company Director you are responsible for security on the sites you manage. Your Company should ensure reasonable steps are taken to prevent unauthorised access. (a) Preventing children or vulnerable people entering the construction site. Consider schools or care homes located near the site. (b) Rights of way through your site. (c) Other work areas next to your site, e.g. a shop refurbishment in a shopping centre. (d) Occupied houses next to your site, especially on new-build housing estates. (a) Perimeter fencing and warning notices should be posted. Gaps between gates and the ground and between fixed and moveable fencing should be minimised so that small children cannot climb through or under the fence. (b) Fencing should be regularly checked to ensure the fence is kept in good order and that there are no materials, skips, plant, etc. stored or parked where they may assist a trespasser to climb into the site. (c) In occupied buildings or public spaces with access to the scaffold at several levels fencing should be used to close off all access opportunities. (d) Site personnel and site visitors should sign in the site register when they arrive on site and to sign out when they leave site. (e) Construction work should not start until the site has been made secure. (f) Warning signage should be fixed to the scaffolding. (g) If employees suspects that a person they see on site is not authorised to be there, they should report their suspicions to the Site Manager. The Site Manager should immediately investigate and if the person is unauthorised, request that they leave site immediately. (h) All plant should be switched off at the end of the working day. (i) Ladders should be locked to the scaffold, until they are next required. A check at the end of each shift should take place to ensure all doors are locked gates locked and any alarms set. Where it is not practicable to remove bottom ladder a ladder guard may be used. As a Construction business there are many things that you do for which you can see an immediate benefit. There are other things that you should do for which the benefits are not so immediately apparent. But that does not mean the benefits are not there, or even that they are insignificant – sometimes in fact, they are very big indeed. A Construction Risk Register – which simply put, is a Register of the types of work a business carries out, the tools and machinery used in carrying out that work – and what likelihood and severity of risk each task carries with it. People have even been heard to ask: So what is the point? My answer would be that the point and the returns are not only many-fold, but done just once, it thereafter only needs a bit of maintenance to be kept up to date. 1. Peace of mind: Complying with the HSE requirements is a legal requirement and compiling a Construction Risk Register is part of that requirement for Companies employing over 5 employees. Until it is carried out and documented, any business is essentially playing the percentages of something not going wrong. Once a Construction Risk Register is compiled, all those involved in running and operating the business can look at systems to reduce risk within their business. 2. Easier employee training: Once you have your Construction Risk Register, all employees (new and existing) can be trained in the same way. Nothing is missed or taken for granted and risks are greatly reduced. 3. Focus on the main issues: Because a Construction Risk Register Risk not only considers each aspect of the job but also considers the likelihood and severity of each risk associated with each task, everything can be treated in accordance with the assessed degree of potential risk. 4. Impact on business cost: Not having an up to date Construction Risk Register means that a business runs the risk of being fined (possibly heavily so), if an accident does happen. The business can also be sued by the victim (or others) and that is not to even mention the possibility of legal criminal negligence procedures against the owners and managers. Not having a Construction Risk Register thereby puts the business itself at risk. One only has to look at all the “have you had an injury?” adverts to guess the size of the “accident” business. To save you looking it up, the answer, according to the HSE is around £14.9 billion p.a. 5. Fewer personal Injuries (and worse): This is the big one! Since 1974 the number of all types of accidents at work have reduced significantly. Fatal injuries have dropped by an astonishing 85%. Non-fatal injuries by over 60%. The list of improvements is extensive. For your own and your employees safely and to protect your business and acquire some peace of mind – don’t put it off: Make sure you consider all the types of operations your business carries out and the tools and equipment that is used, and compile a Construction Risk Register Risk. Oh! And the bit of maintenance that I mentioned? It is simple. Once your Construction Risk Register is in place just update it whenever you take on a new business task or buy any new equipment. Owen Construction Consultancy is happy to help if you have any questions. First Aid Courses for employees Owen Construction Consultancy recently attended 1 day first aid training course. The course provided attendees with the life skills to take proactive action in the event of a person requiring first aid and learning skills that can literally mean the saving of a life. The course provided by Samantha Jones was conducted at a sensible pace and made the learning of such an important subject enjoyable. Face fit testing is a method for checking that a tight fitting face mask seals adequately to the person’s face. Current regulations state that Face fit testing is required for anyone who wears a tight fitting face mask for work, which includes disposable single use FFP3 face masks and P3 half masks commonly in use on construction sites. With the number of compensation claims increasing, employers who do nothing to tackle this issue are increasing the risk of legal action being taken against them by both past and current employees and are leaving themselves open to the possibility of fines and enforcement notices being issued from the Health and Safety Executive. All dust is dangerous and many people suffer life changing illnesses as a result of working in hazardous conditions without adequate protection. Just a small leak in the face mask can lead to contaminants being breathed in. Our Qualitative face fit testing service gives you peace of mind that your work force is being protected and is available across London and the South East. For further details or to arrange face fit testing go to our contact page and send an email and we will make arrangements to carry out face fitting. At Owen Construction Consultancy we have been working with many contractors helping them obtain the CHAS Accreditation. Having CHAS Accreditation demonstrates that contractors meet the recognised standards within Construction Health and Safety and is a game changer in assisting then to be awarded contracts that they tender for. Most local authorities and many other organisations will insist on contractors being CHAS accredited before considering them for the contract. At Owen Construction Consultancy we are very familiar with the process and can complete the CHAS registration along with any other supporting documents that may be required. The HSE which is Britain’s National regulating body for Health and Safety in the workplace launched its second phase of their construction inspection campaigning December 2017. The Health and Safety Executive reported that in 2015/2016 over 40 people were fatally injured and ten times that number died from construction related ill health. The HSE is requesting that every construction contractor, designer and client is not adding to the unacceptable toll by not managing the well-known risks to an acceptable level. The campaign will focus on some of the most common failings such as Fall from heights, control of harmful dust including silica from brick and stone, asbestos and wood dust. Structural safety, work at height, welfare provisions, material handling and good order are other areas that the HSE will be focusing on. In the 1st phase of the inspections the HSE found many examples of small sites working safely and protecting their workers to a highly satisfactory standard, proving that it is possible. Owen Construction Consultancy can provide a comprehensive Health and Safety Policy that will ensure all contractors, designers, clients have the highest level of compliance in place, which will avoid any failings should the HSE choose to inspect their site. If you have a construction project and require an on-site health and safety file to be completed contact Owen Construction Consultancy. We will review your project specification, drawings and planning conditions. A Construction Phase plan can then be drafted. All documents are inserted into a file and sent to your chosen address. Owen Construction Consultancy are excited to announce their appointment as clerk of works on the redevelopment project at the fellowship inn which is situated in Bellingham South east London on behalf of Phoenix Community Housing Association. Heritage lottery fund has provided a £4.2 million grant to restore the pub which dates back to the 1920s. The plans are to include a cinema, live music / theatre / comedy venue, a café, a pub and a microbrewery as well as a music hub which will include rehearsal space. Please contact Owen CC if you require clerk of works services for building projects or if you require any on-site health and safety planning. Construction companies need to be aware of the new Health and a Safety Executive sentencing guidelines, last year fines issues by the Health and Safety Executive reached nearly £13m. Some of the industry’s big names have been hit as they were unaware that in Feb 2016 penalties are calculated proportional to the companies actual turnover.as well as financial penalties, custodial sentences have been issued, where fatalities have occurred. Construction companies large or small must recognise health and Safety as a priority, risks must be assessed carefully and training undertaken. Own Construction Consultancy provide the Construction Industry with a fully up to date Health and safety Policy which includes method statements and over 20 risk assessments. For a FREE quote, simply call 01689 820105 or 07966 286770. The health and safety executive have recently carried out an investigation when using combination ladders. There are some basic checks that need carrying out. (a) Carry out a pre check before use. (b) Always check the instructions and ensure you use the ladder in accordance to the instructions. (c) Check the locking mechanisms before accessing the ladder. (c) Check the locking mechanisms on each rung before accessing the ladder. Ensure the ladders are stored and transported in accordance to the manufactures instructions. When purchasing these types of ladders ensure you purchase from a reputable organisation and a BS EN 131 number is on the product. There have been cheap imports resulting in fatal accidents so beware. A fatal fall from a skylight resulted in a company director receiving a fine plus 160 hours of community service. A roofer from South Wales working on a factory roof, fell more than 7 meters through a skylight to his death. It was found by the HSE that the roofing company’s work at heights control measures were inadequate. Having an up to date construction phase plan may have avoided this fatal situation arising. Owen Construction Consultancy have just launched their new and improved Health and safety Policy for small to medium sized builders. The revised Construction Phase plan ensures that your company can benefit from a very user friendly and up to date Health and Safety Policy. School demolition site sees construction worker crushed by an onsite excavator. Last month a Demolition company was sentenced after a worker on their school demolition site suffered crush injuries as he was hit then run over by an onsite excavator. The Demolition Company were brought in to demolish the school in order to make way for a new leisure centre. The company were prosecuted by the Health and Safety executive (HSE) after they found that the arrangements they had in place to ensure that pedestrians and vehicles were separated were inadequate. The control of workers on site was proven to be insufficient. The incident which took place in November 2013 and has left a dad of four children with life changing injuries and even after several operations to rebuild his foot, he has been left in severe pain and unable to work. The Demolition Company pleaded guilty to breach of section 2 (1) of the Health and Safety at work act 1974 and regulation 13 (2) of the Construction Design Management (CDM) regulation 2007 and they were fined a total of £47,000 including costs. After the hearing the Health and Safety Executive (HSE) declared that this was an incident that could have been avoided if the correct planning of the work had been put in place. Owen Construction Consultancy can provide the Principal Contractors with a demolition plan. A roofing contractor based in the East of England has been fined for several health and safety failings. These safety failings have put 3 workers in severe danger. The court heard how the company was contracted to carry out roofing works at a premises in Hertfordshire. The work on the roof was halted by the client after they were informed by the Health and Safety Executive (HSE) of unsafe working methods following their site visit. In Jan 2015 the Health and Safety Executive discovered that workers were being put at risk by working on a very fragile roof without adequate controls. They were also found to be using inadequate equipment. The court heard that there was a clear lack of planning management and supervision on the site. The contractor pleaded guilty of breaching regulation 13 (2) of the Construction Design Management (CDM) regulations 2007 and regulation 9(2) of the Working at Heights regulations 2005 and was duly fined £2,500 and ordered to pay costs of £1,459. The Health and Safety Executive Inspector reported after the hearing that workers are at high risk when carrying out work on fragile asbestos cement sheet roofs and there is a history of fatal injuries. Workers are at risk of falling through the roof if precautions are not put in place. Owen Construction provides Construction phase plans including the correct management of working at height. An Exeter based roofing contractor has been fined a total of £19,070 including costs when an operative fell through a roof light working on a fragile roof. The operative sustained head, wrist and hip injuries. Owen Construction provide method statements for high risk works. A builder from Luton removed an asbestos ceiling from Caddington Village School without implementing proper asbestos controls and was found in breach of the Control of Asbestos Regulations 2012. A fine including costs of £3,962.00 was imposed by Luton Magistrates Court on the builder. Owen Construction provides Construction phase plans including the correct management of asbestos. A principal contractor based in central London was fined £51,112.00 including costs after being found guilty section 3(1) of the health and safety at work act 1974 after two men sustained serious injuries after hitting a live cable buried in brickwork with a jack hammer. Owen Construction can provide risk and method statements when carrying out works adjacent to live services. A Newport company who specialises in paint coatings has been fined for exposing its employees to health risks. Shot blasting old paint from metal window frames exposed employees to high levels of lead. The Company was fined a total of £10,324.00 after pleading guilty to breaching regulations 5, 6.10 of the control of lead at work regulations. Owen Construction provides information and guidance when working with lead. A Helensburgh contractor working at Heatheryknowe Primary School in East Kilbride hit an underground cable whilst digging holes for fencing. The Company were found in breach of CDM 2007 regulations and fined a total of £7,500.00. Owen Construction Consultancy provide risk and method statements for ground works using cable avoidance tools would have prevented this accident from occurring. Owen Construction Consultancy can provide advice on how to plan monitor and manage these types of works safely. Simply erecting goal posts could have avoided this accident. Owen Construction Consultancy works with builders setting up safe systems of work. A construction Company from Leicester were observed by Health and Safety Executive inspectors to be throwing sacks of rubbish from a fifth floor window and were found to be working without edge protection to a flat roof. Leicester Magistrates’ Court fined the Company £14,182.00 including cost after the Company admitted breaching of Regulation 4(1) of the Work at Height Regulations 2005. Owen Construction Consultancy work can provide site inspection on behalf of builders and provide inspection reports to ensure work is being carried out safely. A Demolition Company from Scotland has been fined £5,000 after pleading guilty to health and safety failings following a worker’s fall from height. An operative fell from a mobile scaffold tower and sustained serious injuries to his arms and head. The tower had been incorrectly assembled. Owen Construction Consultancy ensure Companies are aware of the importance of correct training such as Prefabricated Access Supplies & Manufactures Association (PASMA) training. A Northampton Company was fined £7,398.00 including cost when an operative was hit in the eye by a shard of metal. The safety glasses that were being used were not impact absorbing goggles merely lightweight spectacles. Owen Construction Consultancy ensure Companies are aware of the importance of correct training and personal protective equipment when using cartridge tools. A roofing Contractor from Solihull has been fined a total of £17,083.00 including costs when an operative tripped and fell against a guard rail around the perimeter of a flat roof. The guard rail gave way and the operative fell 3 meters and sustained serious injuries. Owen Construction Consultancy can provide health and safety inspections ensuring scaffolding is correctly erected. An international Building Company was fined a total of £43,761.00 including costs. The Spanish Building Company was refurbishing a high street clothing shop in the centre of Manchester. The Company was found in breach of working at height regulations not providing welfare facilities, poor housekeeping was observed, failure to control dust and out of date fire extinguishers were on site. Owen Construction Consultancy can provide site health and safety inspections providing management with advice and guidance and ensure safe systems of work are in place. An Essex builder has been fined by Westminster Magistrates Court a total of £22,373.00 after exposing their employees to asbestos when carrying out refurbishment work to building in Kensington Central London. Owen Construction Consultancy can provide pre-construction information approve a construction phase plan prior to works commencing on site. A Cheshire builder was in breach of regulations 7-22 of the “Construction Design Management Regulations” 2007 and was fined a total of £6,495.00 including costs. There was lack of welfare facilities on site, poor access and egress poor management of dust. Owen Construction Consultancy work with builders setting up safe systems of work. A self employed labourer fell from a step ladder and sustained fatal injuries. The principle contractor from Baldersby Thirsk was found guilty of not providing a suitable risk assessment or supervising the work properly and was fined a total of £19,000.00. Owen Construction Consultancy can provide risk assessments and method statements. A builder from Wedmore in Somerset has been fined £29,738 after an employee sustained life changing injuries falling 5 meters through a fragile roof light. A planned safe method of working at height was not in place. Owen Construction Consultancy can provide risk assessments and method statements for working at height. A Salford construction firm has been fined a total of £15,590.00 after breaching Section 22 (1)(c) of the Construction (Design and Management) Regulations and Regulation 7(1) of the Control of Substances Hazardous to Health Regulations an employee sustained cement burns to his knees. The operative spent 12 days in hospital. Suitable personal protective clothing (PPE) was not issued by the Company and welfare facilities were not on site. Owen Construction Consultancy can provide Construction Phase Plans to principle Contractors to ensure safe systems are in place. A worker dismantling a barge in Erith Kent sustained life changing injuries requiring a double amputation of both legs. Safe working systems were not in place. The London based Demolition Company was found guilty of breach of section 3(1) of the health and safety act 1974 and fined a total of £50,000 including costs. Owen Construction Consultancy work with clients to ensure safe systems of work, risk assessments and method statements are in place prior to carrying out dangerous works. A builder from Stoke employed a plumber who was not a member of Gas safe. The builder appeared before Newton Abbot Magistrate’s court and was fined by a total of £6,500.00. Owen Construction Consultancy provides “Contractor evaluation forms” to their clients ensuring sub contractors are properly vetted prior to commencing works on site. A Sheffield Property and Cleaning Company were found guilty of breaching “work at height regulation” whilst working on a fragile roof. Sheffield Magistrates fined the Company a total of £6,853.00. Owen Construction Consultancy work with clients to ensure safe systems of work, risk assessments and method statements are in place prior to carrying out working at height. A Director of a Ramsgate Building Company was sentenced to 12 months in prison suspended for two years. The director was also fined a total of £100,000 including costs. Failure to pay the fine within a two year period will lead to an 18 month custodial sentence. The court heard how an employee was fatally injured when a trench he was working in collapsed. Owen Construction Consultancy can draft a Construction Phase Plan simply using a trench box can prevent the collapse of a trench. A new build construction Company from Newport have been fined a total of £16,668.00 including costs after a two year old boy gained access to one of their developments. This was a breach of CDM 2015 regulations. Owen Construction Consultancy can provide a construction phase plan for a builder to ensure security is in place prior to works commencing. A construction Company from Lyme Regis has been fined with costs totalling £3,043.00 after a young carpenter sustained injuries to his hand whilst using a flip over saw. The young worker had one finger amputated. The company was found to be in breach of the Provision and Use of Work Equipment Regulations 1998. Owen Construction Consultancy can ensure you have systems in place to ensure unsafe work equipment is not used. A prohibition notice was issued for unsafe scaffolding to a property developer and scaffold company in West London refurbishing a hotel. Both Companies did not comply with the notice served. The scaffold Company was fined with costs totalling £19,084.00 breaching Working at Height Regulations 2005. A property developer was also fined £19,052.00 for breaching CDM regulation 2007. Owen Construction Consultancy can advise Companies how to comply with Working at Height Regulations 2005 and also compliance to Construction Design Management revised Regulations 2015. A Bristol worker died after a mini digger he was driving drove out of a 4th story opening while moving fibre glass tanks. Euro Solutions limited who are no longer trading were fined £80,000 a site supervisor was fined £7,500.00 and given an 18 month custodial sentence suspended for two years. Owen Construction Consultancy can provide guidance and help in producing a construction health and safety plan. A Plumber from Stonham installed an unsafe gas boiler and was also the subject of previous complaints from the HSE. The plumber was sentenced to 9 months imprisonment suspended for 15 months and ordered to pay his victims £27,490.00 within a 12 month period or serve the 15 month prison sentence. He was ordered to pay costs of £16,000.00. A 52 year old bricklayer fell through a fragile roof and died as a result of his injuries. A Director of a Yorkshire roofing Company incurred costs and a fine totalling £119,381.00. A construction phase plan was in place but the Company failed to adhere to the plan. Owen Construction Consultancy can prepare Construction phase plans. A roofing contractor from Ipswich has been fined £12,000.00 with of costs of £1,320.00 after removing asbestos board from a porch roof. Owen Construction Consultancy can help you manage asbestos. Abattoir owners from East Sussex are fined including costs of £3,190.00 after a worker falls through a fragile roof. Owen Construction Consultancy can ensure your Company does not breach Work at height regulations 2005. A Lincolnshire farm fractured a gas main positioned only a few inches underground. The same pipe being struck back in 1997. No action was taken by the farm owners and a breach of section 2(1) health and safety at work was found to have taken place. The Company was fined £22,000 plus costs of £2,407.00. Ensuring a health and safety file detailing residual hazards could have prevented this accident. Owen Construction Consultancy provide Health and safety files. A Doncaster man was working with a hand held grinding machine. The abrasive wheel burst causing him to lose his life. The steel foundry owners were fined £150,000.00 plus costs of £24,400.00. Owen Construction Consultants provide abrasive wheel training in partnership with the Association of CDM Co-coordinators. A food waste recycling company from Staffordshire was fined £660,000.00 plus costs of £187, 632.00 after a second death at their works. A self employed contractor died as steam entered an industrial cooker he was repairing. The man died from scalding injuries the next day. There was no “confined space” safe working process in place. Owen Construction Consultancy provides confined space training. A London firm constructing staircases has been fined £9,000.00 plus £1,563.00 costs after pleading guilty to breaching the work at height regulations 2005. An operative was injured when a personnel cage he was working from was hit by an overhead crane. The operative suffered severe cuts and was off of work for three weeks. The new CDM 2015 regulations coming into force in April now include domestic projects. The Health and Safety Executive carried out a two day inspection initiative on domestic basement projects 49% of sites fail inspection resulting in heavy fines and loss of profits. Enforcement action taken on 62 sites. 2 sites were closed down. Contractors who are unable to provide a construction phase plan and not complying with the new regulations will mean these already high Health and Safety construction site inspection failure rates will enviably increase. Owen Construction Consultancy can advise and help your Company avoid substantial fines and possible site closer by advising you how to manage your site safely and comply with the new CDM 2015 regulations. Contact us now on 07966 286770 to ensure your Company is not subject to Health and Safety enforcement action. This is an easy to use web site and app and very useful for tradesmen, surveyors and building owners who come into contact with asbestos in there day to day activities. The free ‘Beware Asbestos’ web app (www.beware-asbestos.info) leads tradespeople through a list of simple multiple-choice questions about type of building they are working in, the jobs that they are doing, and the type of asbestos-containing material they are working on. Web site users are then given simple, practical advice for working with asbestos. The Health and Safety Executive is committed to giving away 200,000 asbestos safety kits through ‘Trade point’ stores across the UK. Owen Construction Consultancy Ltd has been on the new web site and highly recommends it as a very useful tool and would encourage all personnel who have a duty to identify or manage asbestos to use this web site. Asbestos still remains a risk within our industry with an average 20 trade’s people dying per week from asbestos related diseases. Health and Safety Executive is urging the construction industry to ensure basic health and safety measures are in place after a month long inspection initiative found 40 per cent of sites failing to properly protect workers. 1748 sites were visited 1 in 5 sites (350) were so poor formal enforcement action was taken by the HSE. Failure to control and manage dust, vibration, asbestos and welfare facilities resulted in action being taken on 122 sites. One of the biggest concerns failings to provide safe working conditions for working at height with 142 enforcement notices being served by HSE inspectors. “The inability to properly plan working at height continues to be a major issue, despite well-known safety measures being straightforward to implement. It is just not acceptable that Inspectors had to order work to stop immediately on over 200 occasions because of dangerous practices. The Consultation on replacement of the Construction (Design and Management) Regulations 2007 has now been closed. All comments were received on 6th June 2014 and we now wait for the HSE response and finalisation of the Draft although we feel that not much in the Consultation will be altered before the actual CDM Regulations become law in April 2015. The Association of CDM Co-ordinators cannot see the HSE changing their views on the split role for the CDM Co-ordinator or revision to the F10 Notification or simplification of competency and the possible clarification of the 2007 CDM Regulations in general for small builders. The main aim of the HSE is to make the Client, Principal Designer and Principal Contractor all fully responsible for the well being of everybody involved in a construction project. The inclusion of domestic projects in the revised regulations will not be a simple exercise for Clients/Householders to find Principle Designers or Principal Contractors who will be willing to take on the role. The Association of CDM Co-ordinators cannot see Designers and Contractors lining up to be Principal CDM Co-ordinators and initially we feel that the role of CDM Co-ordinators will still flourish and be treated as a single “Pre and Post contract exercise as before” by a Principal CDM Co-ordinator. To understand the CDM contents now to be revised and re-organised by the HSE we must still be fully aware of CDM Regulations 1994 and 2007 as these changes were a progression from the original European Directive Temporary or Mobile Construction Site Directive (TMCSD) introduced in 1992 and then adapted and revised in 1994 and 2007 and now further revised to revert back to the original general intentions of the TMCSD. Any one of the Duty Holders with duties carried through and revised in 2015 must still be aware of the progression of duties as some duties from all previous CDM Regulations still apply to the Regulations revisited 2015. For example formation of the documents Pre Construction Information, Construction Phase Plan and Health and Safety File are to be carried through from 2007 and included in the Principal Designer and Principal Contractor’s terms of appointment. The F10 Notification will not apply to any commercial or domestic project unless the project involves a contract period of more than 30 days and on which more than 20 workers are working simultaneously or exceeding 500 person days and the Client is responsible to submit the F10 to the HSE. How many days for 20 workers working simultaneously during a contract for the F10 to apply? Who signs off the Construction Phase Plan? Who checks the competency of Principal Co-ordinators and others? Who is responsible for design changes during the contract? Who signs off the risk assessments and method statements? The Association of CDM Co-ordinators are concerned that, at present, there will be no lead-in period for the change over from 2007 regulations to 2015 regulations. Where a project began before the new regulations come into force, the Client must appoint a Principal Designer and a Principal Contractor as soon as is practicable. Where a Principal Contractor has already been appointed they must comply with the new regulations immediately. The Health and Safety File prepared under 2007 regulations is deemed to be a Health and Safety File prepared under the new regulations. The Construction Phase Plan prepared under 2007 regulations is deemed to be a Construction Phase Plan prepared under the new regulations. The Pre Construction Information prepared under the 2007 regulations is deemed to be Pre Construction Information under the new regulations. Where a notice has been given under 2007 regulations it is deemed to be a notice under the new regulations (if applicable). Every commercial and domestic project must comply with the new regulations on the first day they come into force. Could the Principal Designer role create a conflict of interest with their designs not under discussion with the other duty holders? These new changes will affect a whole raft of construction Professionals including Clerk of Works and Building Inspectors who will need to inform and advise Clients on the forthcoming changes. On the matter of insurance cover the commercial duty holders hold at present – will it now cover all the new commercial duty holders for their revised duties and all the domestic duty holders for their their new duties? After all non-compliance will breach the Health and Safety at Work Act 1974 and every EU regulation on health and safety including CDM and may nullify any insurance claims. We are very aware that many professionals, designers, contractors, installers, sub-contractors and tradesmen, etc, in fact many people in the construction industry, who have not bothered with CDM but now, with the blanket inclusion of commercial and domestic projects, they will have no option, under criminal law, but to comply completely with Construction ( Design and Management) Regulations 2015. The Association of CDM Co-ordinators will be continuing our present distant learning and one day courses until next March 2015 and our new course incorporating the new 2015 regulations will start in late April 2015. The Association of CDM Co-ordinators are also preparing half day seminars in Ipswich and Waltham Abbey ( off the M25 ) in the next few months running through into 2015 for those who are well versed with CDM 1994-2014 but need to extend their CPD points and CDM knowledge into this new area. The overall goal is to increase awareness of the HSEs expectations of the industry and to demonstrate the agencies use of enforcement action where necessary to prevent immediate risk and bring about improvements. Are you looking at your plant and concerned at the cost of replacing old ladders? The trade body “The ladder Association” is running an exchange scheme it runs from the 1st of September to the 31st December. Falls from height still remain one of the main causes of death within the construction industry. Check out https://www.ladderexchange.org.uk and within the web site you can find a local partner Company who will trade in your old ladder for new. The web site gives guidance as to fault finding and defect spotting when inspecting your ladders and step ladders. Is your Company ready to assume the role of Principle Designer under the new CDM 2015 regulations coming into force in April 2015? Replacing the CDM Coordinator role with a Principal Designer for Health and Safety in the project team. Introduction of a duty to provide information, instruction, training and supervision which replaces the duty to assess competence. Placing construction phase co-ordination duties with the Principal Contractor. Imposing Client duties for domestic projects. The Principal Designer for health and safety will be responsible for planning, managing and monitoring the preconstruction phase. The responsibility for ensuring the functions of the Principal Designer and health and safety are met will rest with an individual or business in charge of the preconstruction phase. The role of Principal Designer will lie in the project team. Owen Construction Consultancy can assume that role for your organisation as a small and vastly experienced Company we hope we can become part of your team guiding you through CDM 2015. So please contact us for a free consultation advising you how to best manage CDM 2015 on your projects. Are you managing your health and safety out on site to the satisfaction of the Health and Safety executive? Taken from the Health and Safety Executive web site this month. 239 health-related Notices of Contravention were served at 201 sites. Owen Construction Consultancy Ltd can provide you with a free review of your health and safety management procedures meet on a one to one basis and help you avoid the pain 286 sites out of 560 sites endured after their visit from the Health and Safety Executive.